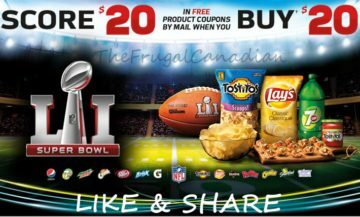 Buy $20, Get $20 Free Pepsico Products Coupon Booklet – More Info. Offer valid with the purchase of any combination of participating PepsiCo products for a total of $20 or more (before taxes) at participating retailers across Canada. Products must be purchased between January 1, 2017 and February 14, 2017 in the same transaction, and receipts must be uploaded by February 17, 2017.